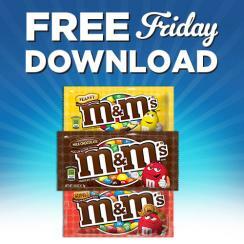 Free M&M’s Milk Chocolate, Peanut or Peanut Butter Single (1.63-1.7 oz.) in Kroger stores, with coupon. This Kroger Free Friday Coupon is available for download on Friday, October 13, 2017 but you have until October 29, 2017 to redeem it. What is M&M’s Milk Chocolate, Peanut or Peanut Butter Single? A classic chocolate candy. A treat that’s made with real milk chocolate and surrounded by a colorful candy shell, the perfect snack & movie candy. Ingredients: Milk Chocolate (Sugar, Chocolate, Skim Milk, Cocoa Butter, Lactose, Milkfat, Soy Lecithin, Salt, Artificial Flavors), Sugar, Cornstarch, Less than 1% – Corn Syrup, Dextrin, Coloring (Includes Blue 1 Lake, Yellow 6, Red 40, Yellow 5, Blue 1, Red 40 Lake, Blue 2 Lake, Yellow 6 Lake, Yellow 5 Lake, Blue 2), Gum Acacia. Redeem your coupon in-store within 2 weeks for One Free M&M’s Milk Chocolate, Peanut or Peanut Butter Single (1.63-1.7 oz.). Your coupon will automatically be applied at checkout when you use your Shopper’s Card. Available in most stores.